Discussion in 'Team Fortress 2 Talk' started by tf2.com, Aug 4, 2011. What the initial version of TF did have, though, was a Soldier class wielding the original Quake's iconic weapon, the rocket launcher. Now, fifteen years later, thanks to Bethesda and id software you too can wield that same rocket launcher in TF2, original sound effects and all. 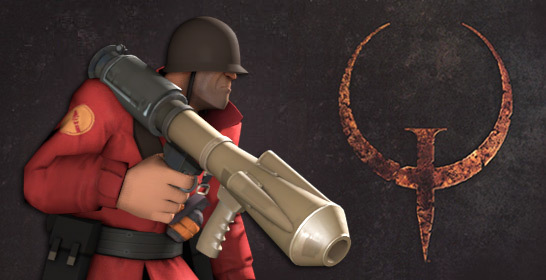 It ended up being surprisingly difficult to integrate the Quake rocket launcher into TF2, mainly because any time we started working on it, we'd get sidetracked by hours of reminiscing: about that first Quake game, about its impact on us all personally, and on Valve overall. When Quake celebrated its 15th birthday this past June 22nd, we realized just how damn many of us at Valve are here because of id software. Some of us were inspired by their games' technical prowess, and others by getting their first taste of game development thanks to Doom and Quake's revolutionary approach to user-generated content. So, thanks id, for... well, everything. Speaking of which, i actually replaced the rocket launcher sound with the one from HL1. It actually sounded better; unfortunately i could only get it to work in local games. Online it'd jitter or just not operate at all and default to the TF2 rocket launch sound. im guessing the launcher wont be craftable? It seems the first person shows the launcher in the direct centre of the screen, which is a blast from the past! I'm pretty sure it will, since they're doing both Genuine and normal ones. I have an unused quake IV (i never got around to installing it) game, (hard copy), does anybody know if I install it now do I get the quake launcher? It probably will be in a week or so... It just won't be "genuine"
It is, but I'm really not sure I want enough of what's in it to pay that much money in one sitting. I know there are some games I don't care about, and there's no way to get a pack and gift individual games to other people, is there? Not even if you do that "gift it to yourself" trick? Thank God it's just a reskin (right?). Also, Brink hats in my TF2? And Skyrim? Is TF2 eventually going to just be the Kevin Bacon of video game universes? Even though the Quake rocket launcher is a reskin, I want it so bad. Sounds like a friggin' artillery cannon. Oh, and I got a hat for Brink. 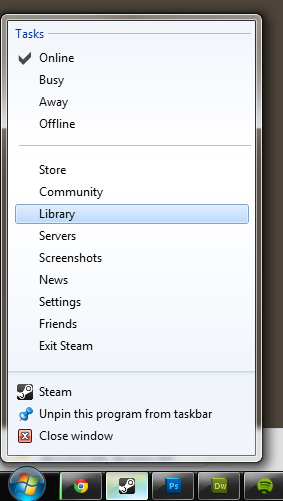 Now it just needs modding tools, and maybe it will survive past November. It's TECHNICALLY not a reskin! The rocket comes out the center of the screen. It's a big upgrade. All projectiles should fire from the centre, anyway. It'd certainly make balancing mirrored 5CP maps a whole lot more easier. 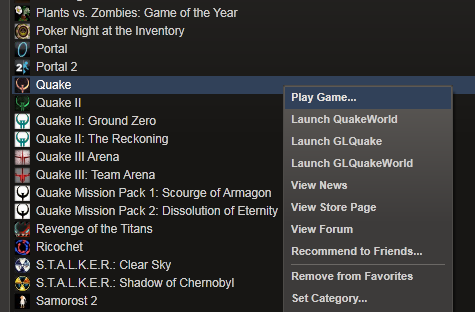 Also, i'm guessing there's nothing for me if I only have Quake IV on disk right? 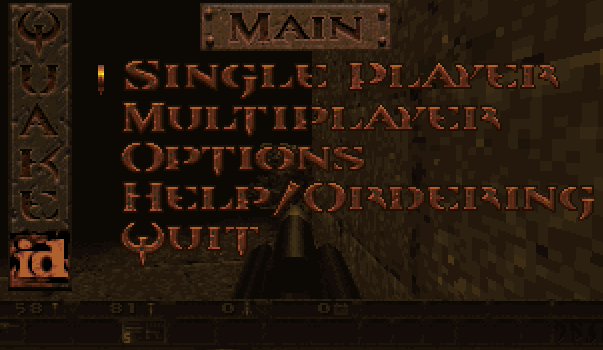 I'd buy Quake 1 or 2 for that launcher, rather than Q4. I know the rocket-launcher is iconic, but... Another soldier weapon? What's wrong with the grenade-launcher "reskin" for the Demoman, or the super-nailgun for the Heavy, or the bloody axe for almost anybody? does anybody really care? valve can't do anything without it being complained about.